Spinello Aretino (1350/52-1410) was born in Arezzo, Tuscany and most likely first trained in the family workshop before deriving his art from the influence of such important masters of the 13th century as Maso di Banco (active 1336-1346), Buffalmacco (ca. 1314-ca. 1351) and Giotto (1266/67-1337). He achieved a rapid success and received his most important commissions in Arezzo, Lucca, Florence, Pisa and Siena. His art had a great impact on the development of the next generation of Tuscan artists including Late Gothic painters such as Lorenzo Monaco and the Master of the Straus Madonna as well as Masaccio and his generation. This painting was originally a double-sided banner for the confraternity of Sts Anthony Abbot and Eligius in Borgo Sansepolcro, Tuscany. Such confraternities were generally occupied with healing the sick and burying the dead. This explains the presence of St. Eligius, a 7th-century French bishop whose good works included burial of the dead. The banner is a rare example of the very few surviving banners from the 14th century and was probably made by an artist in the immediate circle of Spinello Aretino whose art was most influential in Tuscany at the time. A two-sided processional banner. 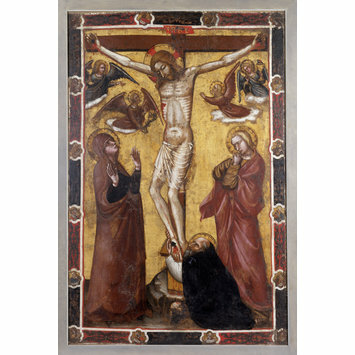 One side shows the Crucifixion, with the Virgin and St John the Evangelist on either side. In the upper register, four lamenting angels surround Christ, three hold chalices to receive the blood from Christ's wounds. St Anthony Abbot kneels at the foot of the cross and holds the base of the Crucifix. The other side of the banner depicts the enthroned St Anthony Abbot and St Eligius. Four members of a flagellant confraternity, identifiable by the hooded white robes with the holes cut out the back, are on the lower right and left, looking up at the saints. Each side is framed by a border in which red and dark brown panels alternate. The panels are separated by medallions in which busts of saints (on the St Anthony and St Eligius side) and prophets (on the Crucifixion side) appear. Due to damage, not all of the figures can be identified however the visible attributes suggest the identifications. On the Sts Anthony and Eligius side, the order is as follows: Upper left, unrecognizable, middle two medallions: the Angel Gabriel and the Annunciate Virgin, far right damaged. Right side: damaged (St John the Baptist? ), St Catherine of Alessandria, an unidentified Franciscan, a Cardinal (probably St Jerome). Bottom (reading from right to left, to left of Jerome) St Helen, St Agatha, a pope (probably Gregory the Great). Left side (reading from bottom to top), St Agnes, St Lawrence, Mary Magdalene, deacon saint (?) (perhaps St Steven). On the Crucifixion side, the order is as follows: the upper section four medallions, all illegible, right side, second medallion (reading down) illegible, third medallion Samuel, fourth Abraha(m), bottom (reading from right to left) David, third possibly Enoch, fourth damaged, left side reading from bottom to top, Jonathan (?) Habakkuk, possibly Daniel, fifth illegible. Purchased from A.L. Collie of Old Bond Street, London for £89.5, 1894. The banner was not yet attributed to Barnaba da Modena and described as a "banner painted on both sides in tempera in wood frame." Historical significance: 781-1894 is a confraternal banner, i.e. a double faced large canvas of either square or upright rectangular shape bound to a lance shaft, which became the most common form of flag in Europe from the 13th century. It was used to display heraldic charges of communities and royal arms in procession. Although evidence for confraternal banners exists in documents and illustrated manuscripts, their fragile nature has allowed very few to survive. Painted on canvas or silk, banners were exposed to the elements and the fabric tended to suffer damage. The survival of the V&A banner, from such an early date, is highly unusual. Dehmer listed only six banners from the late 14th to early 15th centuries that have survived; three from the Marche, two from Tuscany and one from the Venetian island of Torcello. The origin of the V&A banner is unclear. Following Berenson, Kauffmann attributed it to Barnaba da Modena and proposed that it may have come from a flagellant confraternity dedicated to St. Anthony in Genoa. He also noted that there was a banner painted by Luca Signorelli for a company dedicated to St. Anthony and St. Eligius in Borgo Sansepolcro that has a similar composition to that of the V&A banner. According to D. Cooper and T. Henry, 781-1894 was in fact originally made for the Confraternity of Saint Anthony Abbot in Borgo Sansepolcro, which has been later replaced by Luca Signorelli's large canvas banner still in situ (D. Franklin, 2010). Furthermore Signorelli’s banner replicates the same iconography as the V&A work except from the addition of the scene of the swooning Virgin and the representation of the two saints seated rather than standing. 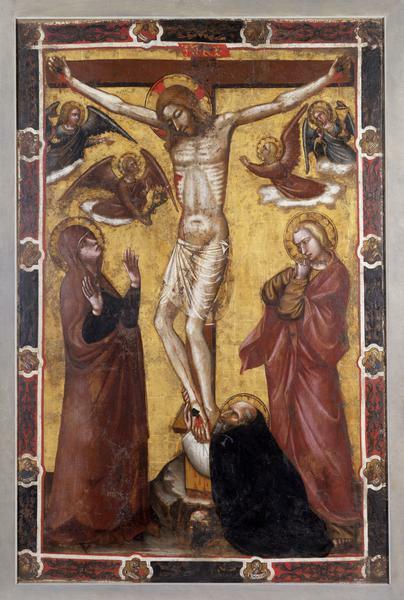 All these elements tend to point at a Tuscan artist active in the late 14th century and possibly associated with Spinello Aretino whose Crucifixion in the Museo Nazionale di Villa Guinigi, Lucca presents an almost identical crucified Christ. In addition, Spinello Aretino is recorded to have supplied one other confraternity banner to Sansepolcro of a similar size. The association of the two saints, Anthony and Eligius, appears to be quite rare in Italian art and particularly focused on Sansepolcro. In fact, St Anthony Abbot and St Eligius are represented on a relief from the church of Sant’Antonio also in Borgo Sansepolcro. The saints are also shown together in a fresco currently in the Museo Civico di Sansepolcro. St Eligius is shown wearing a red cloak, hat and holding a horse’s hoof, with St Anthony Abbot who holds a bell, on one side of an enthroned Virgin and Child. The two saints are separated by an unidentified coat of arms. On the other side of the throne, St Catherine of Alexandria is shown with her spiked wheel. 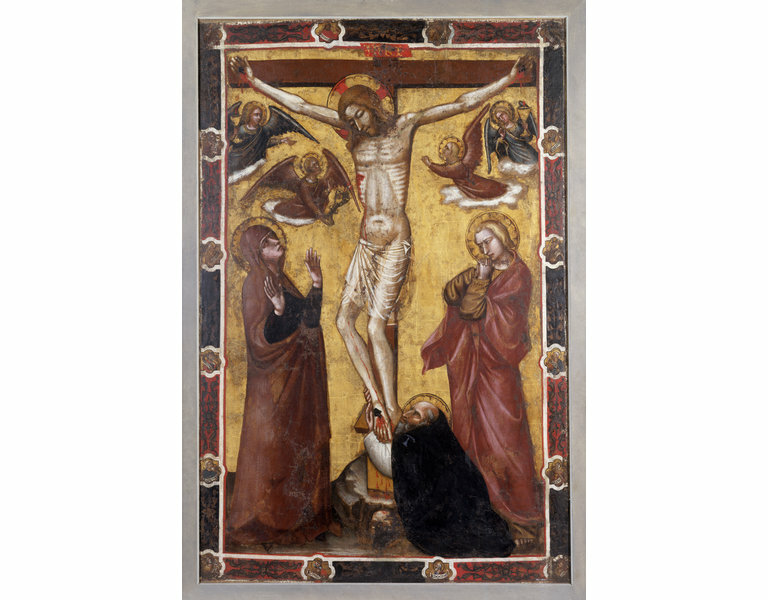 The unusual imbalance of this composition, with the two saints on one side and St Catherine on the other suggests that Sts Eligius and Anthony Abbot were seen as a pair in San Sepolcro, and may provide further evidence for the provenance of the V&A banner. St Eligius was the patron saint of goldsmiths and blacksmiths. St Anthony Abbot was the patron saint of a variety of professions; including caretakers of animals (especially pigs), glove makers, weavers, shearers, butchers, delicatessen owners, basket makers, and gravediggers. There was also a religious order dedicated to St Anthony which was founded at the church of St.Antoine de Viennois. This order founded hospitals (mainly to care for skin related diseases, such as “St Anthony’s Fire” a type of eruption on the skin along the nerve endings). The monks wore black robes with a blue Tau as their symbol – similar to that of St Anthony in the V&A banner, though his has gold striations. It is possible that the large amount of gold on the banner – including on his robe, on the background and on St Eligius’ robe could allude to the high presence of goldsmiths in the confraternity at Borgo San Sepolcro and thus also explain the presence of St Eligius, who is dressed as a wealthy layman in a red fur-lined cloak with what appear to be gold buttons or trim (Bodger). Confraternities (also known as brotherhoods, sodalities or companies) played important roles in daily life in Italy from the 1200s onwards. Laymen (and sometimes women) joined these mutual aid societies in order to provide insurance for their families, and to participate in acts of charity. Each confraternity had a patron saint, and could be based in parish churches, mendicant churches, or chapels attached to hospitals. The earliest confraternities were called laudesi companies and were dedicated to singing hymns to the Madonna. Brotherhoods could also be made up of members of a particular guild, neighborhood or nationality. After the mid1400s, the brotherhoods tended to build their own private oratories which included a meeting space, a chapel and storage rooms for processional gear. Such gear could include processional crosses, banners which depicted their patron saint, and the hooded robes that members wore in order to protect their identities. Penitential confraternities were also known as flagellant companies, compagnie di battuti or disciplinati. They grew out of the flagellant processions involving men, women and children which swept over the Italian peninsula during the 1200s at the urging of Raniero Fasani, a preacher from Umbria. They were soon prohibited by the pope, who saw them as heretical. The plague of 1348 caused their revival, only this time in the form of smaller, more tightly organized confraternities. Flagellant confraternities tended to be city-wide, often associated with hospitals, and restricted to men. Flagellants’ robes had holes cut out in the back in order that they might whip themselves. In the 1400s flagellation was not as common in processions and was more often carried out as a group activity in one room in the oratory, usually under the cover of darkness on Friday evenings. Religious processions on saints’ feast days or holidays were a common feature of the Renaissance city. The brothers would wear matching robes that identified them as members, and the lead man often carried a banner with an image of the company’s patron saint on one side, and an image of Christ or the crucifixion on the other side. This ensured that an image on each side would be seen as the procession moved through the town. After their use in processions, banners could be stored in the company’s oratory or displayed on the oratory’s altar. Cambiaso, D. "Casacce e Confraternite Medievale in Genova e Liguria," Acti della Societa Ligure di Storia Patria, lxxi, 1948, pp.81-111. Kauffmann, C. M. "Barnaba da Modena and the Flagellants of Genoa," V&A Museum Bulletin, ii, 1966, pp. 12-20. Pesenti, F. "Barnabas de Mutina Pinxit in Janua": I polittici di Murcia", Bollettino d'Arte, 53, I, 1968, pp.22-27. Algeri, Giuliana, "L'attivita tarda di Barnaba da Modena: una nuova ipotesi di ricostruzione," Arte Cristiana, 1989, v.77, no.732, pp.189-210, p.201. Bodger, Caroline, "A Fourteenth Century Processional Banner by Barnaba da Modena," MA Thesis, Courtauld Institute, London, 2003. Banker, J., The Culture of San Sepolcro during the Youth of Piero della Francesca, Ann Arbor (Michigan), 2003, pp. 165ff. D. Franklin, 'Signorelli's banner and its frame for the Confraternity of St Anthony Abbot in Sansepolcro' in The Burlington Magazine, August 2010, pp. 512-516. D. Cooper and T. Henry, 'Letter. A confraternity banner from Sansepolcro in The Victoria and Albert Museum' in The Burlington Magazine, November 2010, p. 744. Acquired as 'Italian middle 14th century', this banner was attributed to Barnaba by Berenson in 1932 and his attribution has been generally accepted until D. Cooper and T. Henry's article, Nov. 2010.